Linear motion on-off valves. Pneumatic actuated. Quarter-turn ball valves available in manual, electric, or pneumatic actuators. Brass, stainless steel, and plastic models. Quarter-turn ball valves available with electric or pneumatic actuators. Brass, stainless steel, and plastic models. Quarter-turn ball valves available with manual hand lever actuators. Brass, stainless steel, and plastic models. Quarter-turn butterfly valves available with manaul hand lever or hand wheel actuators. Steel and plastic models. Manual gear operators and SAE valves. Back flow prevention valves. Inline and flap models. Diaphragm valves for controlling air pulses in dust collectors. Linear motion valves for flow control of gases, liquids, and steam. Pneumatic actuated. Manual linear motion valves for precise flow control in low flow, small pipe applications. Linear motion globe valve for flow control that has its own mechanical temperatrue sensor and temperature set point. Electric actuated valves for flow control of hot and cold water in HVAC systems. Provides excellent filtration to help prevent damage to valves, meters, etc. from rust and dirt, without sacrificing high flow characteristics. Connectors that allow for easy installation of blow tube through the dust collector wall and eliminate the need for welding of use of additional flanges. Electric motors for positioning of dampers in HVAC systems. Filters, regulators and lubricators for pneumatic systems. Controls the current position of a valve or damper. 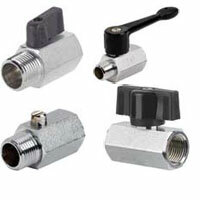 Controls the current position of a valve or damper with a pressure control output. Converts a pneumatic control signal to an electrical 4 to 20 mA control signal. A one to one signal to output relay that receives the positioner’s signal output and supplies the proper air pressure to the actuator to reduce response and adjustment time. Pnuematic and electric actuators for automating quarter-turn valves. Sign up for job alert emails!